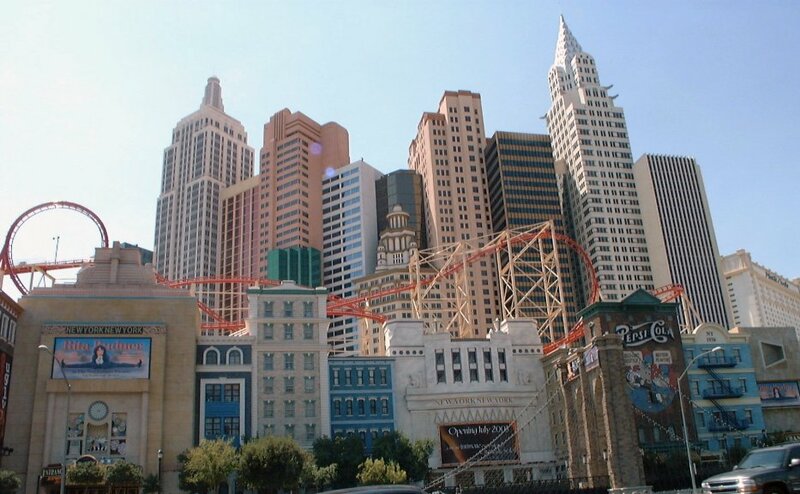 The innovative facades of the New York - New York Hotel & Casino re-create the classic Manhattan skyline, complete with 12 New York-style skyscrapers which house 2,024 guest rooms. These interconnected structures are approximately one-third the actual size of the New York City architecture. The tallest building replicates the Empire State Building at 529 feet, 47 stories. Other icons include a 150-foot replica of the Statue of Liberty; a Coney Island-style roller coaster called Manhattan Express, a 300-foot long replica of the Brooklyn Bridge; and a replica of the Soldiers and Sailors Monument. Please click on the thumbnails below to see pictures of New York - New York. The facade of the central hotel structure includes scaled-down replicas of (left to right): the Lever House , Empire State Building, 55 Water Street, Century Building, Liberty Plaza, New Yorker Hotel, Seagram Building, Chrysler Building, and the CBS Building. The Manhattan Express Roller Coaster twists, loops and dives around the perimeter of the New York - New York. With heights of 203 feet, drops of 144 feet and speeds up to 67 MPH, it allows riders to experience the force of negative g's. Simulating a barrel-roll in a jet fighter, it rolls 180 degrees, hangs 86 feet in the air, then dives back under itself. Personally, I found it to be way too bumpy! 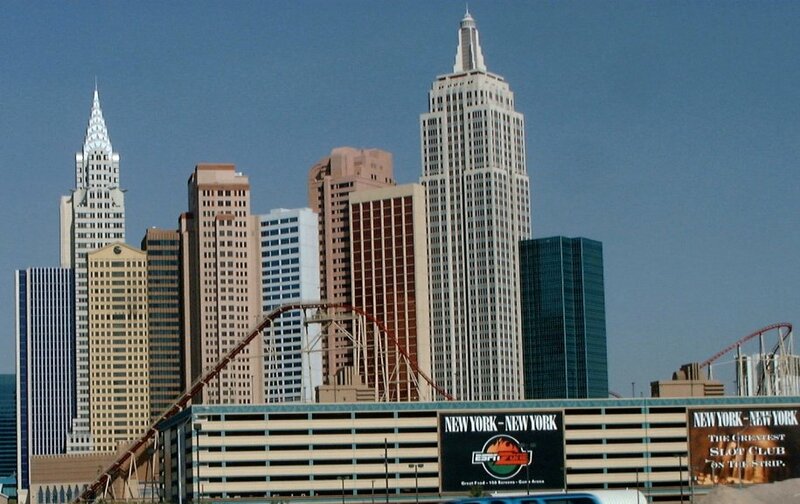 Replicas of ten prominent New York City towers form the hotel structure of the New York New York. 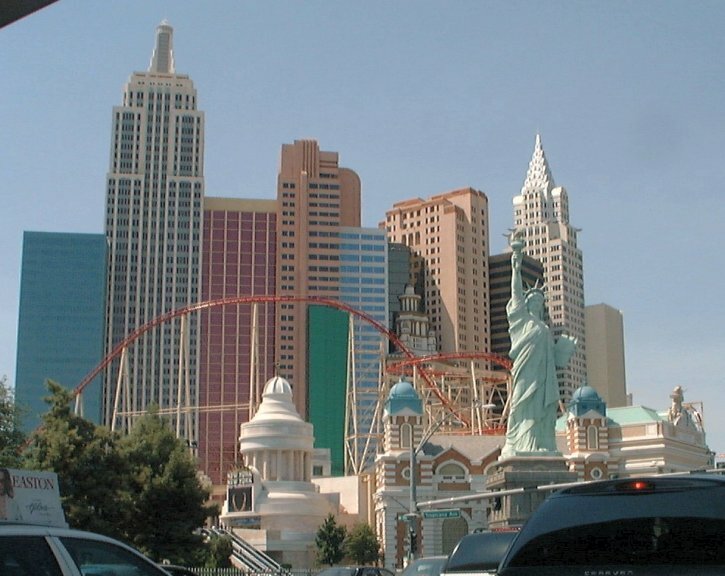 Other famous New York City buildings form the exterior of the lower casino structures in front. 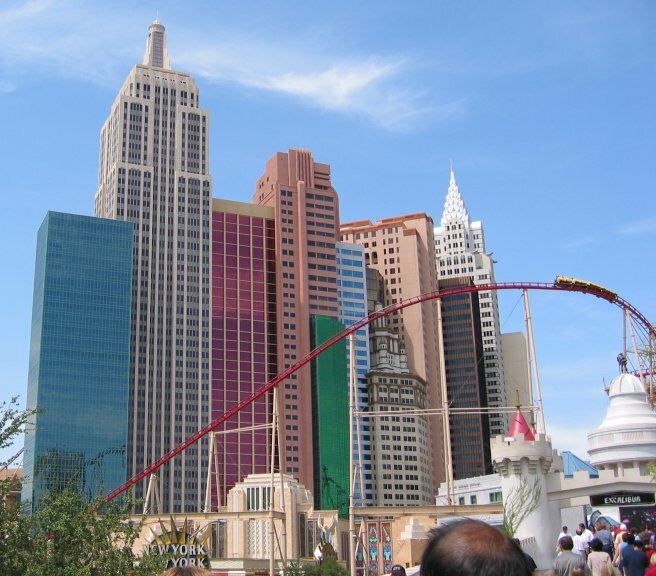 The rear "skyline" of the hotel buildings are in the reverse order of those described in the first picture with a replica of the AT&T Building added (yellow, third from left). 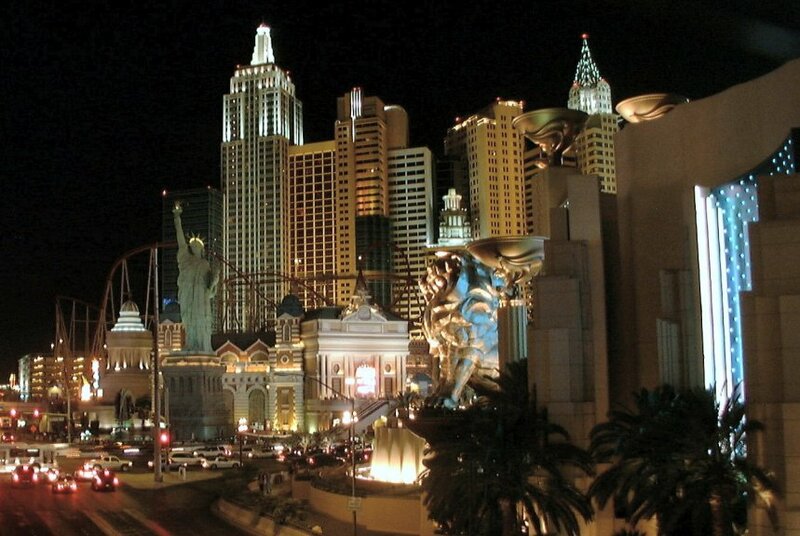 Night view of New York - New York and part of the MGM Grand from the pedestrian overpass connecting the Tropicana and MGM Grand. 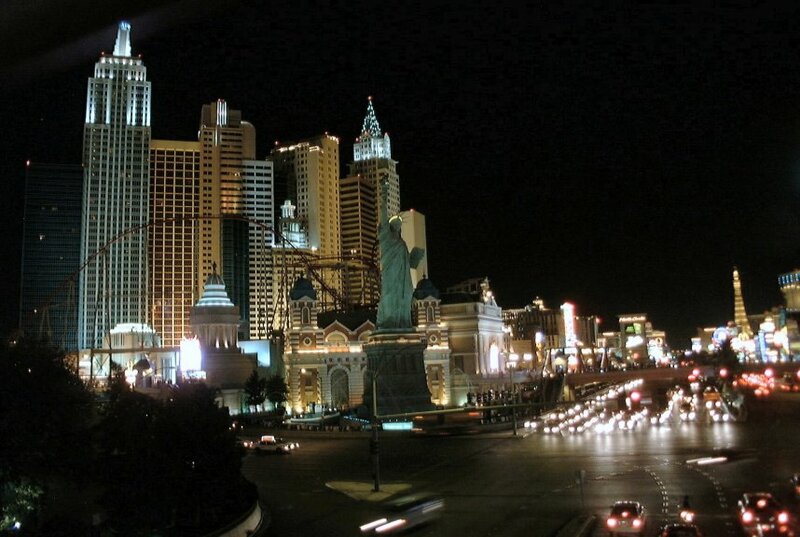 Night view of New York - New York and the Strip from the pedestrian overpass connecting the Tropicana and Excalibur.